Are you facing tooth loss or missing teeth? Living in ill-fitting dentures? Hiding your smile? Avoiding foods because of missing teeth? 40 years or older? 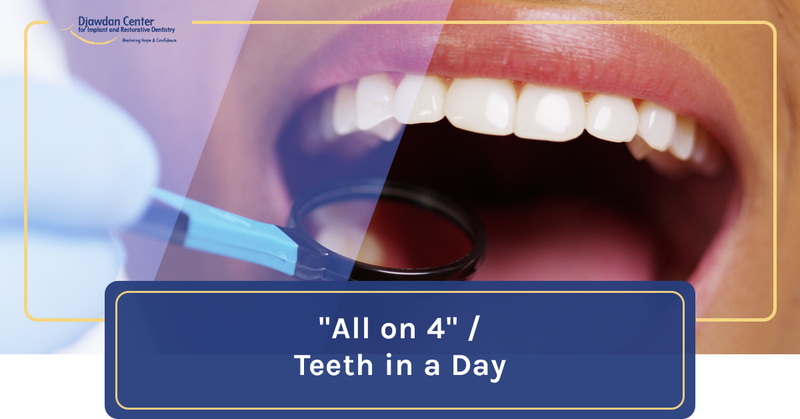 Dr. Djwadan has a solution for you with the All-on-4 treatment or Teeth in a Day! Get a gorgeous set of teeth while you sleep with our sedation dentistry practices. Ruth had bad experiences with other local dentists in the past, so she wasn’t sure what to expect from Dr. Djawdan. But from the moment she walked in the door, she felt like she was home. She said she was also surprised by how little pain there was after the procedure – and the results speak for themselves. Dave suffered from bad teeth since he was a child. He got a new set of teeth with virtually no pain and a simple recovery. Dave loves to smile again. Using the revolutionary All-on-4® dental implant treatment, Dr. Djwadan can get you in a gorgeous set of teeth. This the ideal solution for those that are about to lose or have lost all their upper and/or lower teeth. These permanent teeth are natural-looking and allow you to look & feel years younger. 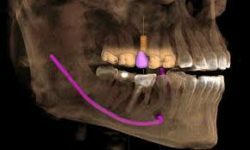 The All-on-4® technique utilizes four dental implants to secure your teeth permanently in a minimally invasive procedure. You literally wake up with a new set of teeth. Full set of natural-looking teeth. Enjoy all the foods you like. No limited diet. Easy to care for, just treat them like regular teeth. Minimal procedures and visits compared to all other implant procedures. A long-lasting smile that never has to be removed. Prevents sunken jaw appearance due to missing teeth. Never have grandma’s removable dentures. Look & feel years younger. HOW DO ALL-ON-4/TEETH IN A DAY DENTAL IMPLANTS WORK? This technique uses dental implants that are placed at mechanical inclinations much like the triangles used in mechanical engineering of trusses used in roofs and bridges to maximize support. 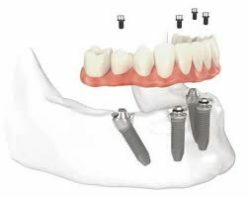 The use of angled implant placement allows us to avoid anatomical areas that previously required bone grafting. Eliminating the need for bone grafting eliminates months of waiting and thousands of dollars. Dr. Djawdan is thrilled to be able to offer this solution to people who suffer with ill-fitting dentures or are faced with losing all of their teeth and have to endure the hardship of wearing dentures. Now when a patient is faced with losing his or her teeth they do not have to settle for just a denture. With a digital CT scan taken right here in our Annapolis, Maryland dental office, Dr. Djawdan uses 3D imaging software to visualize the placement of dental implants and then designs a surgical guide. 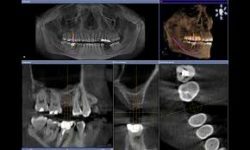 Using 3D imaging and virtual planning software, we can design a minimally invasive surgical plan to take the remaining teeth and replace them with dental implants the same day. An immediate denture that has been fabricated in advance will then be converted at the time of surgery to a temporary hybrid fixed bridge. Possible adjunctive procedures include volume reduction of blood platelets for Leukocyte- and platelet-rich fibrin (L-PRF) to accelerate tissue regeneration and bone grafting – maxillary. 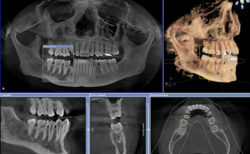 The permanent Prettau dental implant bridge will be completed in a few months once the implants have fully integrated. Teeth in a day/All on 4 dental implants can get you talking, smiling and eating confidently again. Historically, patients losing their teeth or with ill-fitting dentures seeking an alternative were sadly disappointed to learn that the dental implants required several dental surgeries over the course of 9-12 months: first graft bone, wait a few months, place dental implants, wait a few months and fabricate the new crown and bridge or overdentures supported by the dental implants; not to mention the cost of this approach ranged from $35,000 to $45,000 per arch. Today, our local dental clinic can help patients who have hopeless and or missing teeth in one surgical visit. Our surgical approach reduces time and cost. The actual cost of dental implant treatment is based on a number of factors, such as the number of teeth being replaced, the type of implant supported teeth (treatment option) recommended and whether additional procedures are necessary to achieve the proper esthetic and functional result. There is often a misconception that there is a set cost for each dental implant. The fees are calculated based on the amount of time we anticipate spending to complete treatment (implant placement, other surgical procedures, fabrication of replacement teeth…) as well as the estimated cost of dental implants, other components and materials necessary to complete treatment and dental laboratory fees. The all -inclusive fee for All on 4/Teeth in a day ranges $ 20,000 to $ 25,000 per jaw. QUESTION: WILL MY INSURANCE PAY FOR IMPLANTS? The extent of your coverage will depend on your individual plan and the implant benefits included. Very few dental insurance plans cover implants placement; however, fabrication of the replacement teeth is often partially covered up to your annual maximum (the average annual benefit for most dental plans is $1,500.00).  We make having the smile you want affordable. For your convenience, we accept all major credit cards. Our dental practice in Annapolis is pleased to present flexible payment plans through Lending Club Patient Solutions. Enjoy a selection of flexible plans with low fixed rates and monthly payments, no upfront payment, and no prepayment penalty. Our dental office in Annapolis welcomes the opportunity to help patients explore all possible dental treatment solutions. We are not a corporate chain with high pressure sales people. There is no “one-size-fits-all” solution.  We believe in listening to what you want to achieve and then designing a custom treatment solution based on what you to achieve. You may have several treatment options to consider. We understand that most people have to plan and budget for the treatment they want and we welcome the opportunity to be a part of that process. If you have questions, please feel free to call us at 410-618-5966 if it’s after office hours you can email us by filling in the Have a Question contact form. If you are ready to schedule your judgement free consultation, please feel free to call or complete the request a consultation form.